Washington Huskies coach Mike Hopkins watches his team during the second half at Alaska Airlines Arena in Seattle, on Sunday, Dec. 10, 2017. Gonzaga Bulldogs won 97-70. Hopkins said the biggest NBA draft stories were Michael Porter Jr. falling to No. 14 and DeAndre Ayton being taken No. 1 overall. 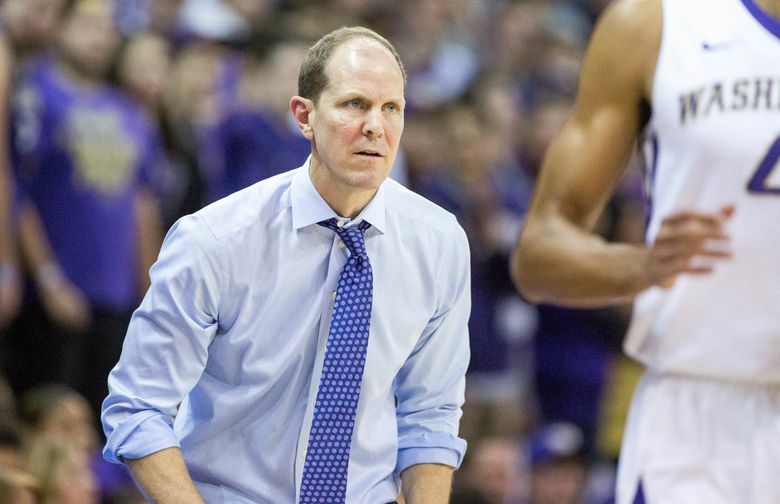 Anyone who tuned into Yahoo’s NBA draft coverage Thursday night discovered what Washington Huskies men’s basketball fans learned last season – coach Mike Hopkins is a bubbling personality with loads of charm, humor and insights about the college game. Hopkins teamed with NBA reporter Chris Mannix, former Atlanta Hawks general manager Wes Wilcox and college basketball reporter Pete Thamel on set while NBA reporter Shams Charania provided updates on the selections and trades during the five-hour telecast. It was the third year Yahoo provided streaming coverage of the draft. Hopkins replaced Tom Crean, who served as an analyst last year. Hopkins displayed extensive knowledge about many of the 60 players who were selected in the draft, but the former Syracuse assistant shined brightest when the conversations steered toward Pac-12 and ACC players. During one playful exchange, Hopkins joked with former Arizona star center DeAndre Ayton, who was taken No. 1 overall by the Phoenix Suns. “DeAndre you had one of the greatest blocks against us that led to an assist for a game winner,” Hopkins said, referring to a 78-75 UW win over then-No. 9 Arizona in which Ayton blocked a shot that sailed to Dominic Green who hit a three-pointer at the buzzer. “I want to thank you for the greatest block in Washington history. Hopkins was also a big fan of Michael Porter Jr., the former Nathan Hale star who was bound for Washington. The 6-foot-10 forward was projected as a top-3 pick before a back injury allowed him to play in just three games last season at Missouri. Porter fell to No. 14 in the first round and was taken by the Denver Nuggets. “I was in the draft room with (former Syracuse star) Hakim Warrick who was supposed to go nine,” Hopkins said. “He was told he was going nine in the morning and dropped all the way to 19 to Memphis. Being in the room with everyone there, the light is shining on you. Everyone is off their chair taking picture in the back and you’re the only one in the room. Last year, the Pac-12 set a league record with 14 players selected in the NBA draft. However, this year only seven Pac-12 players were taken, including Ayton, UCLA’s Aaron Holiday (Indiana – 23), Oregon’s Troy Brown (Washington – 15), USC’s De’Anthony Melton (Houston – 46), USC’s Chimezie Metzu (San Antonio – 49), UCLA’s Thomas Welsh (Denver – 58) and Colorado’s George King (Phoenix – 59). “The Steph Curry comparisons are going to keep going back and forth. But this kid, he’s the closest thing to it. He can shoot behind ball screens. He can create. He’s got great IQ and intelligence. But again it goes back to how are they going to play? I think the biggest reason why he doesn’t become the next Steph Curry is going to be the team. Do they play that style? Do they give him the freedom? Do they put other players around him with the same IQ? I think that’s going to be his biggest question mark, but I love him. “I’ve been fortunate to play against Alonzo (Mourning) and I’ve been around Shaq (O’Neal). A lot of the younger guys don’t understand and they never saw those guys, but when you walked in a gym and you saw Alonzo Mouring you were like omigosh. And that’s what you saw when you play against DeAndre Ayton. Now he’s not the shot-blocker that Alonzao was, but he plays with the same aggression and the same physicality and he has actually, I think, better skill. I just think he’s a can’t-miss prospect. I think he’s going to a great NBA player. “I think he’s one of the best player in the draft if not the best and he’ll be an unbelievable NBA star. I just think the biggest reason why he might not make it is because of the mental makeup. Because at the end of the day, it’s almost like you’re talking yourself into this injury like how am I going to respond to this injury. I wasn’t Michael Porter when I came back to play in the NCAA. Now people are questioning me. It’s the first time he’s ever really hit some adversity. So I think he’s almost taking himself into it. That would be my biggest concern with this. But knowing the background, not knowing him great, but being around where he was going to the University of Washington and talking to people – great family. Great character. Loves to be in the gym. Great worker. “And guys, he went out. Didn’t have to play and played at 60 or 70 percent to try to help his team win a national championship. Ninety-nine point nine-nine percent of every player in the last 10 years of the draft if they were in his position would have never played. Does that make him stupid? Or does that make him a great kid? If he doesn’t play, there’s no questions other than is he going to pass the medicals? But he went out and played. “He played with Trae Young in AAU and it was like a show. You saw guys making great passes to him. He’s finishing at the highest level. He’s raising on his jump shot at 6-11. This guy, he rebounds. In the two games that he played, I think he averaged over 12 rebounds a game and when he played in high school he was averaging over 16 rebounds. To be able to be a wing and rebound at those types of numbers, that’s very, very elite. “There must be a jagged edge in the MRI. He can shoot it. He rebounds at a high clip. He’s a high-character kid. Great in the locker room. There’s like a psyche to this draft. You start to see guys draft and you ask what do they know that I don’t know? Is there something worse? Then it becomes something that’s bigger than what it is. “They should get arrested for stealing because the bottom line is they just got a top three pick at 14. “DNA. DNA. DNA. At the end of the day, he’s had the answers to the test for how many years now? He works the pick-n-roll as well as anybody. Reminds me a little bit because he’s really strong of Kyle Lowry. Gets in the lane. Strong finisher around the rim. He made shots, but he had to take a lot of shots for UCLA. I like him. He’s got great athleticism of getting in the lane. And that DNA. I don’t know if he’s going to be a backup or a starter, but he’s talented. “He’s not a McDonald’s All-American caliber player, but he kept working hard and getting better. Obviously, we know what he did in the NCAA tournament. An extremely good shooter. A catch-and-shoot guy. Reminds me Rex Chapman. Very good athlete and a guy who competes. You start talking about Villanova basketball and how are their guys going to be at the next level? You look at Josh Hart. Tough and competitive kids that go out, play a role and play defense. But this kid can really shoot the ball. “Obviously, he’s an incredible athlete and great at taking the ball to the basket. But in this game and this day in age you got to be able to shoot the basketball. If not you’re like Marcus Smart. There’s value for guys like Marcus Smart. I just don’t know if he makes guys around him better. It’s all for himself. Now can they get him to do that? That’s going to be the big question. But I’m with Pete, I don’t know if he’s a starter in the NBA.